The fourth Quasi-Zenith Satellite (QZS-4) was launched on October 10, 2017. After launch, the satellite test on orbit and the authorization work to confirm performance and compatibility with ground systems have been made. The authorization work has been completed, and trial services started on January 12, 2018 for the following services. The trial services will offer services with the same performance as the operation starting in FY2018.The details are shown on this website's User Interface Specifications page. 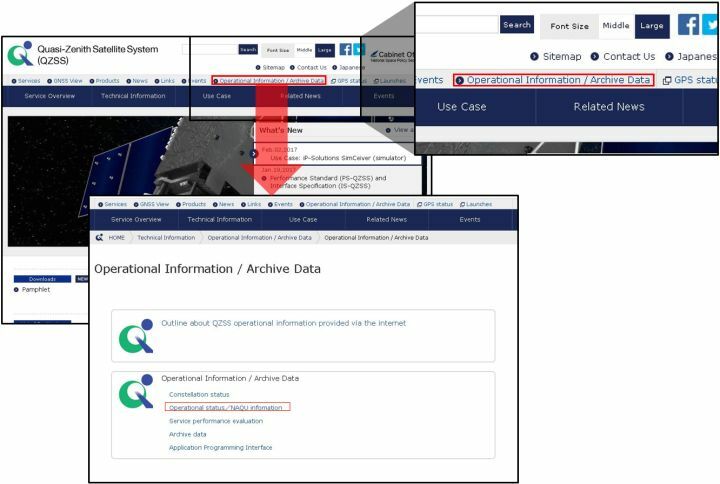 Centi-meter Level Augmentation information trial service starts to broadcast augmentation information for the following GNSS signals shown on this website's Performance Standard (PS-QZSS), 6.1 clause. About Centi-meter Level Augmentation information using other signals, it is planned to be broadcast after the confirmation is completed about CLAS performance depending on GNSS constellation status and the correspondence to GNSS of GEONET. Notice will be posted on this website about the start date of that service and other issues. Information about provided services is available on this website’s Operational status / NAQU information page. While the trial services are available, application demonstrations can be conducted freely using QZS. Receivers for application demonstration can be borrowed at no charge. If you would like to borrow a receiver, please read the information on the Application Demonstration page and then apply. Receivers cannot be directly loaned to people outside of Japan. However, a corporation in Japan may borrow a receiver and use it in other countries at its own cost and responsibility.